Christmas is a celebration of the birth of Jesus. The holiday's connection to Christ is obvious through its Old English root of "Cristes maesse" or Christ's Mass. For Christians, it is the time to renew one's faith, give generously and consider the past. But Christmas is also a secular celebration of family--one that many non-practicing Christians and people of other religions are comfortable accepting as their own. Modern customs of the holiday include gift-giving, church celebrations, and the display of various decorations—including the Christmas tree, lights, mistletoe, nativity scenes and holly. Santa Claus (also referred to as Father Christmas). Prepare any dish that goes with the festive spirit of Christmas. One can even participate by posting festive pictures, Christmas decorations, winter scene, description of Christmas festival etc. 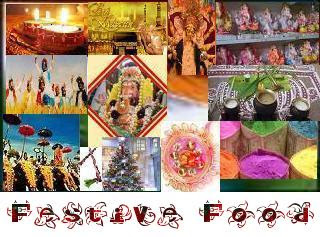 The last date of sending entries for Christmas Feast is 2nd January 2009. Bloggers need to add a link back to this event announcement. I would be glad if you can include the Christmas Feast logo. There are no restrictions on the number of entries. Note ~ Entries without an email will not be included in the round up. Non Bloggers need not get upset, email your recipe along with the picture. We will post it on your behalf and include it in the round up. Old posts are accepted, provided they are republished by linking back this event announcement along with the logo. So don't let the Santa down and enjoy Christmas Feast with him. Hey Purva this is nice, I will try to send it as well. But one thing... the round up is on the 2nd of Dec right? It would have been awesome if it was before Christmas, so people can actually benefit from the event, create new dishes from the various entries... Just a thought. Nice event.. i will try to send it..
wonderful event. shall pitch in. hmm Nice event, no gifts from Santa:( Just kidding!! I'm gonna start looking for recipes now...!!! will send in something for the event..
Nice Event Purva. Count me in. Thks Purva for intimatine me about the event and visiting my blog. Will definitely send in my entry soon. Have an event on my blog too. "Baking for Beginners". Do check out. Thanks for sharing the useful information on Christmas feast. Namaste, great blog here with some nice food tips. Please do check out my blog for diet and health tips. We have a doctor onboard already. It would be great if you signed up too thanks. Thanks purva for this lovely event..am in for the event..btw for ur q"n regarding where do i live in France, am living in Paris just 20 minutes in train from La chapelle... thats so nice of u for thinking both me n sireesha...hope u had a great time in Paris.. I really would love to participate purva....would i guess i couldnt make it in the event....sure to comeup sth next time. Hi Purva, amazing event again! :-) Please collect award at my blog for you. its my pleasure to help u....check this link for guidance http://www.bloggerbuster.com/2007/10/create-navigation-buttons-for-your-blog.html . Its texture was like mixture and some how moist sweet... i know i m confusing u also... ok leave it ma.. no issues. u have something waiting for u in my blog its new and spl... check out. Sounds like a nice event, will try and come up with something for it! i enjoyed sending it over. Good one ..just sent my entry. Its been hrs since i posted my Greek New Year cake..and after that while i was surfing,noticed this lovely event..
Do you think I can send mine to the event ? so how was the event??? looks like a lot of people attended it.